Call 1-888-560-9020 – Satellite Dish TV and Internet – Sales Installs Repairs Moving Upgrades…We do it all! Here’s a great way to save a few bucks on your next internet bill. 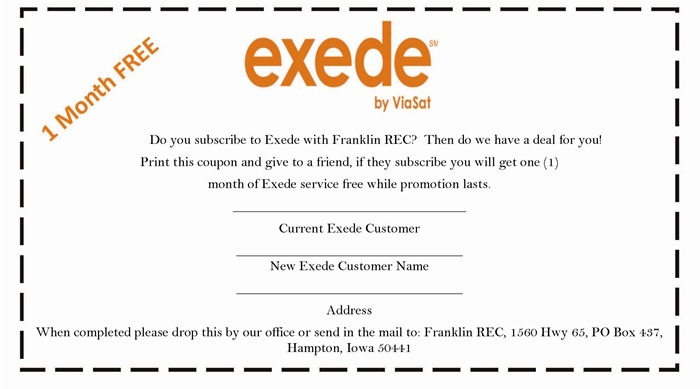 Franklin County REC is offering 1 month free Exeed high-speed internet satellite service to existing customers who sign up a friend for the same great service. What can be better than that?! 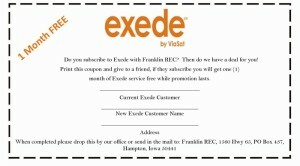 Just print the coupon, fill it out and bring it in to the Franklin County REC. More details on this limited-time offer from the REC here. How does the Dish Network dual tuner work? What is the Dish Network Tailgater?